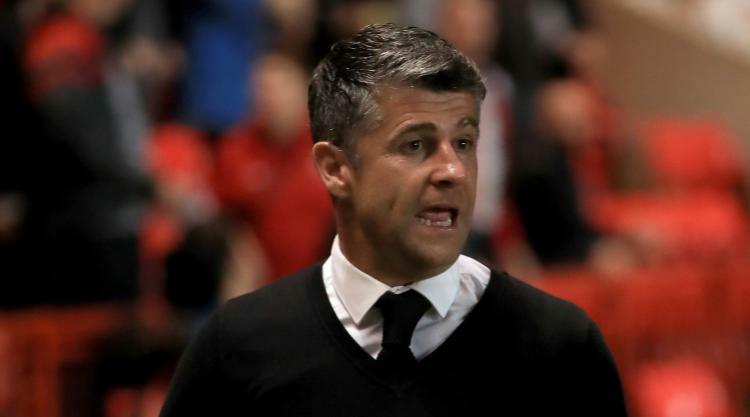 Motherwell manager Stephen Robinson is looking for his side to "take our frustrations out" on Ross County this weekend. Back-to-back defeats in the Ladbrokes Premiership have taken the gloss off what Robinson considered a promising start to the season with four consecutive wins in the Betfred Cup. However, last week's 4-1 defeat to St Johnstone was marred by three red cards, one of which has since been rescinded on appeal, leaving Robinson frustrated despite what he described as a "very good" performance. He said: "When we went down to eight men we showed great character and I'm sure we'll take our frustrations out on Saturday. "We want to get our league season up and running. "We have started well in the cup and the two league games we've lost; we've been very much in the game and had we taken our chances things may well have been different. "It's time to get our league season off and running. "We will play worse than that and win football matches. I would prefer to play poorly and win on Saturday if I'm being honest." Well's early-season form has been severely affected by a spate of red cards, with four shown in total in their previous two games, but Robinson was pleased to see summer arrival Charles Dunne's second in a week overturned on appeal and was not concerned about further discplinary issues. "(It is) justified as he didn't touch him," he said. "Charles Dunne has had two red cards for blowing on people, so it's welcome to Scottish football. "It is what it is, they've overturned one of them. They didn't overturn Trevor's (Carson) which we find very hard to take, but we deal with it and move forward. "We can affect the fact that Carl McHugh went to ground and shouldn't have." He added: "(Is it) an ongoing problem? No." Robinson admitted he still has work to do in the transfer market but could not provide an update on the future of Louis Moult who has so far refused to sign a new contract. He said: "We're currently in discussions with a couple of players. I still want to bring a defender in, I think we could do with a bit more pace out wide and up front." On the future of Moult, who is out of contract at the end of the season, he added: "Louis has indicated to me at this moment in time he's not going to sign a new contract. "We made Louis a really good offer, the best we could possibly make at this football club, but he indicated to me he's not going to sign the contract at this moment in time but not that he wouldn't look at it further down the line." Motherwell have completed one deal, however, with highly-rated goalkeeper Rohan Ferguson arriving on a three-year contract. The 19-year-old has joined from Airdrie but will spend the rest of the season on loan at the League One club. Fir Park team-mates Luke Watt and Jake Hastie are moving to Airdrie for six-month loans. Ferguson, who has played more than 50 first-team games, told www.motherwellfc.co.uk: "It's a massive step for me and the fact that I'll be going back to Airdrie on loan played a big part in my decision because I'll be able to come here and learn from the goalkeepers but also continue to play first-team football." Robinson added: "We have recruited him for the future, so it was extremely important for us to ensure he continues his development by playing games. There was no point him coming here and not playing, so the move suits everyone in the short term."